Pope Pius IX and President Garcia Moreno aimed to turn Equador into an “empire of morality”. Equador's central government depended on the Catholic Church for both its national identity and its state infrastructure, especially in the Indian areas. 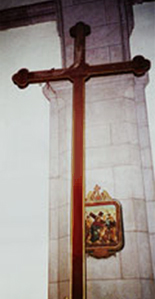 The tall, elegant cross carried through the streets by President Moreno at Easter 1873 reaches as high as the vault of the Quito Cathedral. President Moreno's concordat with the Vatican in 1862 made Catholicism the only religion and fo0rbade the practice of any dissident form of worship” (Art. 1). It gave the Church the power to govern locally, especially in the Indian lands (Art.22). And this pact with the Vatican even overrode the laws of the state (Art. 24). In 1873 the President dedicated Ecuador to the Sacred Heart of Jesus. That same year, after Pius IX was deposed as King of Rome, Moreno supported him with ten percent of the country’s tithes, which in 1873 amounted to 10,000 pesos. The government enforced the collection of these tithes. Thus, although Pius had lost his kingdom in Italy, thanks to Moreno and the concordat, he continued to wield considerable power over his clerically controlled, taxpaying “subjects” in Ecuador. This concordat was made with President Gabriel Garcia Moreno who a few years later stripped all non-Catholics in the country of their citizenship. It is a “maximal concordat” where the Vatican was able to get almost everything it wanted.